Fun With Frisian: MAITIID - "spring, springtime"
Maitiid looks like it could be about the month of May, but it is actually the word for all of spring. The vowels following the m- are pronounced like the word "my," with the same diphthong we have in words like "eye" or "nigh." The second part, tiid, means "time" and is said with the long "ee" sound in the English word "week." MIGH-teed. You can remember the sound of the first syllable by remembering that "springtime is nigh." De maitiid is ien fan de fjouwer jiertiden. The springtime is one of the four seasons. De means "the" and is pronounced with a schwa. Is is just like its English twin "is," as mentioned before. Ien means "one" or "somebody." It is said with a long "ee" like in "week" or "keen," followed by a schwa before the final -n. EE-uhn. I'm guessing that it might be hard to hear the schwa in regular speech, though. Maybe you'd just hear EEn. Fan is a great word to know. You hear it all the time in modern West Frisian. It is pronounced with the sort of "o" heard in the word "pot" or "on," similar to the long "ah" sound in "father." Actually, this word sounds a lot like the word for a young deer... FAWN. It means "of" or "by," but it shows up in all sorts of contexts. Note that P. Sipma spells it fen if you are using his glossary from 1913. This is not the first time his spellings differ from modern use, by any means. Fjouwer means "four" and is pronounced rather like the English word "flower," but with a -y- sound replacing the -l-. FYAU-uhr. Jiertiden is the plural of jiertiid (see that word tiid again? ), which means "season" or, more literally, " time of year." The letter that looks like a "j" is pronounced "y," just like in German. Say the singular with a short "ih" vowel and let the -r- fall away: YIH-teed. The plural has a schwa in the final syllable. YIH-teed-uhn. 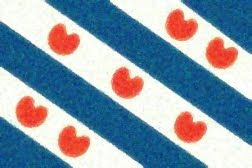 Finally, here is a Frisian children's song about the spring. We'll look into the lyrics in more detail soon, including some parts that have not been translated yet on the website.